Earnest. That might best describe the Truckee Tavern & Grill and its proprietors, Chris St. Martin and Ryan Dierks, who launched the Old Town restaurant specializing in wood-fired cuisine and crafty cocktails two years ago. The longtime pals met at Truckee’s Cottonwood Restaurant, where St. Martin, a Connecticut native, was bar manager for a decade and Dierks, from Colorado, worked as a waiter and bartender for eight years. They had tossed around the idea of opening their own restaurant and, when chef-owner Billy McCullough was looking for a buyer for his long-running Cal-Asian Dragonfly Restaurant & Sushi Bar, decided it was time to move the restaurateur plan from the back burner to the front. Though family members helped out with some renovations, the historic second-floor space—with its rustic exposed brick walls, distressed wood floors and copper-topped tables that can accommodate 120 inside and another 40 on the deck overlooking Old Town during summer season—remains largely unchanged. 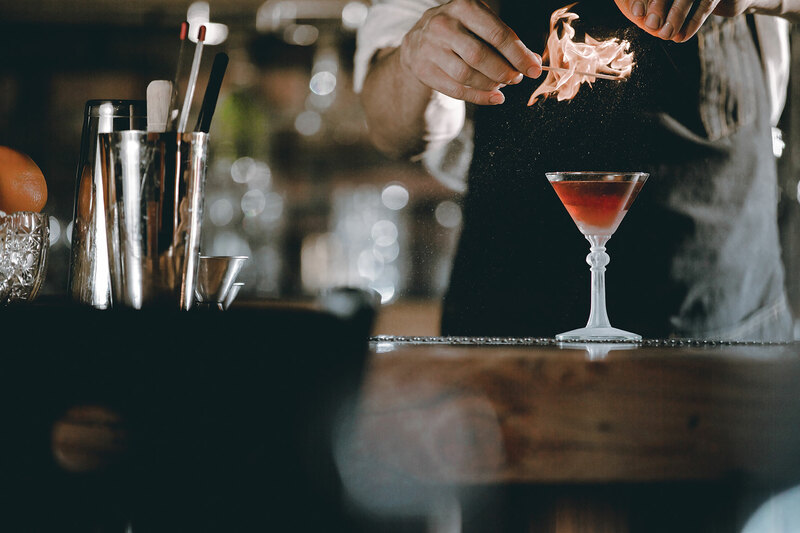 St. Martin and Dierks, who also worked at Vail’s Larkspur and Campo di Fiori, leverage their collective experience behind the bar to highlight Truckee’s noteworthy history with the drink—the town was home to many a bootleg whiskey and gin during Prohibition. Their carefully curated list of spirits includes some 100 whiskies and 30 gins, many from small-batch distilleries. Seasonal cocktails, like the Wilkie Cup, made with rye, basil, maple and Fernet Branca, is named for W.F. Wilkie, a Truckee merchant who did business in the late 1800s. On a more playful note, a recent round of mixology pays tribute to the characters from the Squaw classic, Hot Dog… The Movie, with gin, lemon, pear and rosemary comingled to make a refreshing sip called Sunny. Syrups and shrubs are all made in-house. Wines by the bottle and by the glass venture off the beaten path both by varietal and vintner, and are plentiful on rustic reds from France, Italy, Spain and California that pair well with grilled meats. St. Martin and Dierks, who are aiming for a mostly biodynamic cellar, are happy to guide the inclined to a sip of something new. With all things bar covered, they recruited another Cottonwood colleague, Donovan Webb, who had worked as sous chef there alongside David Smith for nearly six years. A grad of the International Culinary School at the Art Institute of California in Orange County, Webb worked at several SoCal restaurants, including Orange Hill and Trachts, home to famed chef Susan Trachts. He also spent time at Manzanita, at the Ritz-Carlton, Lake Tahoe, under James Beard award-winning chef Traci Des Jardins. That said, dinner could kick off with starters like poached shrimp with a brandy cocktail sauce, maybe venison tortellini with red wine sauce, or perhaps pork belly with pickled fennel and whiskey jus, all of which lean on that well-stocked bar for flavor. Velvety English pea ravioli with hedgehog mushrooms is made in-house, as is the linguini with ricotta (Webb did stints at San Francisco’s Flour+Water and Central Kitchen to perfect his pasta). Shishito peppers are flash fried and topped with lemon honey oil and Maldon sea salt. Salads are simple and straightforward, the kind of combos that work well with any dish: There’s an iceberg wedge with bacon and bleu cheese dressing as well as a butter lettuce tossed with parmesan and Green Goddess, and arugula, beets and burrata mixed with mustard vinaigrette. The heart of the menu revolves around the custom-built Argentine-style grill, which boasts two features that contribute to the cooking process. “The ‘V’-shaped grate filters grease off the grill, which eliminates flare-ups and reduces the bitter char flavor,” says St. Martin, adding the South American-inspired design also lets the chef build the fire in the back of the grill then summon forth fresh hot oak coals as needed. Meats, hormone-free from Niman Ranch, include a pork chop with a whiskey pear sauce, presented on a wood plank. New York and rib eye steaks are grilled and served with house steak sauce, which should be available for sale by the bottle this summer. Buffalo flank, chicken with rosemary mustard jus as well as salmon also face the fire, along with a trio of sausages with house-made mustard. Sides, served à la carte, include a grown-up version of mac and cheese, one recent iteration of which incorporated pear and chevre. And, like any respectable steak spot, there are standout spuds: Yukon Gold and sweet potato mash along with hand-cut fries. Webb knows guests likely go big on the main part of the meal, so he keeps the dessert menu short and sweet: A house-made ricotta cheese topped with Del Rio Farms organic honey and fresh-cracked pepper served with seasonal fruit; Vanilla Wafers topped with vanilla ice cream, chocolate whipped cream, chocolate sauce and dehydrated cherries reconstituted with crème de cacao; and a banana bread served with salted caramel ice cream, caramel sauce and Maldon sea salt. Susan D. Rock is an Incline Village–based writer and editor who is earnest about the dessert menu and wine list. Summer hours: Bar opens nightly at 4 p.m. for cocktails, dining room and patio (weather permitting) at 5 p.m. for dinner. Live music on Thursday nights. Reservations recommended.